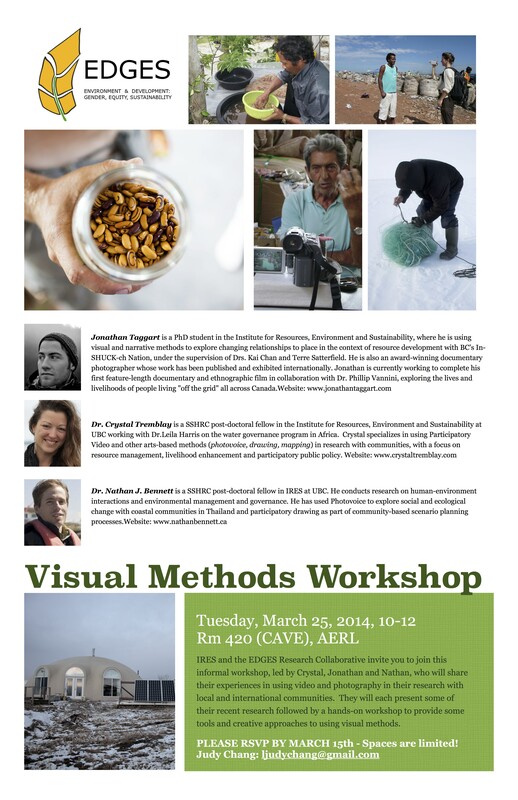 The Institute for Resources, Environment and Sustainability and the EDGES Research Collaborative invite you to join this informal workshop, led by Crystal Tremblay, Jonathan Taggart and Nathan Bennett, who will share their experiences in using video and photography in their research with local and international communities. They will each present some of their recent research followed by a hands-on workshop to provide some tools and creative approaches to using visual methods. This entry was posted in Uncategorized and tagged Crystal Tremblay, documentary film, Environment and Sustainability, Institute for Resources, Jonathan Taggart, Nathan Bennett, participatory methods, Participatory Video, Photovoice, research, visual methods, visual research methods by Nathan J. Bennett. Bookmark the permalink.